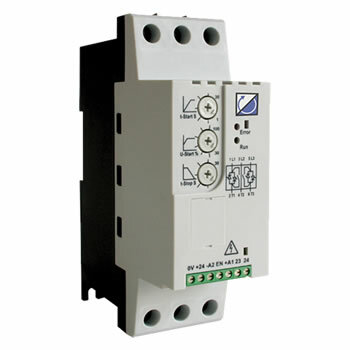 Over Current Protection: Protects the Soft Starter against usage above its duty rating. Internally Bypassed: Reduces cost once bypass is active. Reduces cabinet size and less heat produced. Only 1.8” Wide (Size 1): Same width as typical contactor and enables a more compact cabinet to be used. Din-Rail Mount: For easy installation – it just clips on.